Joshua: Invasion of the giant jellyfish! 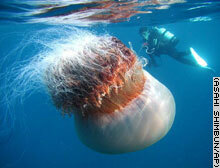 Invasion of the giant jellyfish! A slimy jellyfish weighing as much as a sumo wrestler has Japan's fishing industry in the grip of its poisonous tentacles. Vast numbers of Echizen kurage, or Nomura's jellyfish, have appeared around Japan's coast since July, clogging and ripping fishing nets and forcing fishermen to spend hours hacking them apart before bringing home their reduced catches. Tomorrow read about the giant peanut butter fish and how it mated with the Echizen kurage and produced a new tasty treat! I just wanted you all to know I'm in love with a Joshua! His my life but I wish I could tell him.